February 14, 2012: Isn’t It Romantic? Julie M: So it’s Valentine’s Day. What do you think—a “Top 10” list of our favorite Bollywood love songs? You pick five and I’ll pick five. Here’s “Chal Chal, Mere Sang,” a favorite from Astitva with Tabu getting the moves from the sexiest music teacher, ever, Monish Behl. Whooo Baby…can that Sukhvinder sing! And it’s his own composition. Julie M: Love it! (the song, not the bad pun) How could she resist…I melted just watching it. And speaking of melting, here’s my first offering: “Tere Mere Sapne” from Guide. A little cheesy, but really, wouldn’t you like to have Dev Anand singing this to you? Jenny K: Guide is such a wonderful film, and Waheeda is the picture of a romantic heroine, so lovely…and that song is so sweet, I can see why you chose it. My next one is a bit spicy, as Bollywood offerings go, but definitely romantic. “Aye Udi Udi” from Saathiya, an authorized Hindi remake of Mani Ratnam’s Alai Payuthai, with Rani Mukherji and Viveik Oberoi. They are recent secret newlyweds, honeymooning in their partially finished apartment. It’s Adnan Sami singing AR Rahman’s wonderful music. No subtitles, but the lyrics are translated in the notes beneath the originating Youtube video. Jenny K: Ah, Aamir was my first Bollywood love, too. Brings back memories! One thing that I thought was funny, though, was that it seemed like that love song was her dreaming about him, but he’s dreaming about that vapid hottie he was chasing. So whose dream was it? Julie M: I think they’re dreaming separately. The irony of the juxtaposition is supposed to temper the sweetness a bit. 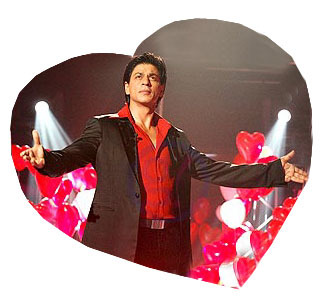 Jenny K: Now, what’s a Valentine’s Day list without Shah Rukh? And since we’ve posted all the songs from Dil Se at one time or another, I think, and “Suraj Hua Madham” from K3G is almost a “given” by now…I’m going with “Main Yahaan Hoon” from Veer-Zaara. It’s a whole lot of SRK yummmm in the middle of this run-of-the-mill movie, with Preity daydreaming that her lost love will interrupt her arranged marriage. Udit Narayan singing, of course, as all the best ones are! Jenny K: Now, I didn’t mean to dis “Suraj Hua Madham”…it’s just that everyone picks it…I know it’s one of my favorites. But your choice from DDLJ is classic, too. Here’s a lovely, sad love song from Raja Hindustani, with Aamir Khan singing about how Karisma Kapoor promised to love him and never leave and she’s doing just that. Lyrics go something like “Oh foreigner, foreigner, don’t go away”. Karisma’s not unaffected by his song with the gypsies; and who would be?! Udit Narayan and Alka Yagnik singing. Love the gypsy costumes! Julie M: If we’re talking sad song, fab costumes and Rahman, I’m going to have to go with “Jashn-e-Bahaara” from Jodhaa Akbar. He’s realizing that he loves this woman he’s married for political reasons, but she’s not displaying similar feelings for him [yet]. The music is so pretty and there’s a lot of attractive alliteration in the lyrics. If you translate the lyrics they don’t make a lot of sense because it’s all poetry, but the gist of it is “It’s spring, but I can’t enjoy it because I don’t know if she loves me–we are so far apart.” Whenever this song comes on my homemade compilation I play it over and over again. Jenny K: Now, that is lush…Mr. Gowariker, the director, must have cornered all the best historical sites…gorgeous images and music. Last on my list, but certainly not least, Sukhwinder Singh singing his own “Ghar Aaja” from the album Nasha Hi Nasha Hai. I’ve played it hundreds of times by now and never tire of it. I have no idea what it means, maybe “Come Home, Now,” but I don’t care about exact translations…just how it makes me feel. The perfect heartbreaking love song. And yes, I know you’ve heard this one in that first batch of songs that I sent you last year, but it’s still the sexiest song I know. Wish “Ghar Aaja” had an actual video but it’s not from a film. And all the other videos I found of it were rather odd visual animations and photo montages set to the song. Thought that this still picture was better than confusing imagery, close your eyes and let it just soak through you. Julie M: You and your Sukhwinder…the very first video you recommended to me was “Chaiyya Chaiyya” from Dil Se, and you went on and on about his voice. He doesn’t hit me the way he hits you, but that’s a great song. For my last offering I’m going to go with “Tum Se Hi” from Jab We Met. “Every breath I have, every day that dawns, is from you…wherever I go I’m never far from you.” I like the guitar, Shahid Kapur’s performance in this film is probably his best, and it’s another pretty one. Jenny K: Actually, Jab We Met is the film that made me take a more serious look at Shahid and the Shahid/Kareena jodi in general. I began to see what others were talking about. Charming film. Similar in sweetness to Katrina and Imraan in Mere Brother, speaking of Valentines. Looking over what I’ve picked, it seems that I really relate to the sad, lingering, lonely love songs, and songs with male vocalists. Oh well, perhaps because I’m single, they ring really true for me, and, of course, my imagination does best when I have the hero singing to me. Really puts me in the mood. Julie M: I like male vocalists too, but my tastes are a bit more traditional. I don’t like the solo instrumentals and shy away from the swelling strings (generally). I don’t groove to the lonely “she done me wrong but I still love her” songs: I like the ones that praise my unique qualities and express undying mutual affection, or say “I love her (him) passionately, does s/he love me as much as I love her (him)?” Or songs that talk about how wonderful being in love is. And it’s always nice to have a guy express that he’ll wait forever until I feel the same way. I think what I react to is strong emotion (why I turned to Bollywood and away from American films, in the first place) in a song, one that make you feel right along with the singer. The happy love songs just effervesce into a fizz of love and float away…hard to pin them down, but the sad or questioning ones hit you right where you live, where all of us have been at one time or another…and they linger there for a long time. Julie M: No, no, way too sad. I was thinking of the title song, but the reprise in the gazebo, which is hands down the most romantic scene ever. Shah Rukh and Kajol, the evergreen couple! Even though it’s the “swelling strings” that I said I hate, it’s excusable. Jenny K: Okay, as long as it’s not version amidst the Scottish castles…too schmaltzy. I like the one in the gazebo, too…yet she’s still crying a good bit here, both before and definitely after. Kajol is a very weepy girl in this film. But she makes us feel her love in every frame of it. And I stand by my choice for this being the most memorable sequence in the film. “Rifat B! My first love is unspoken!” It’s what makes the end result so wonderful! Happy Valentine’s Day, Everyone…enjoy our Top Ten, sorry, Top Twelve!